Prof Haijun Su at Ohio State University had his students design walking machines for their final project in ME 5751. Here are videos of four project teams from that event. 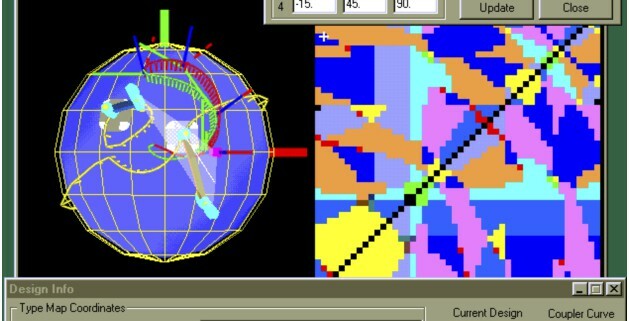 Our Sphinx software was the first computer-aided design system for spherical linkages. It used IRIS system by Silicon Graphics. Collaboration with Judy Vance lead to a Virtual Reality version of this design system. This is a link to the description of this research at Iowa State University. 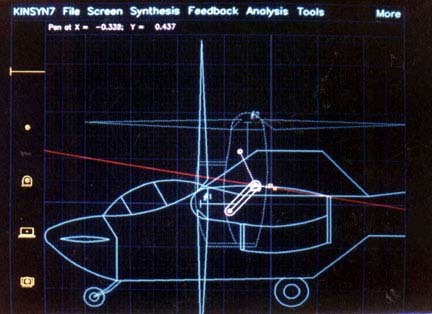 My first experience with computer based kinematic synthesis was a 1982 presentation by Roger Kaufman of his KinSyn linkage design software on an Apple II microcomputer. This is a link to his description of his experience in those early days of computer-aided design of linkages. His paper that describes this software can be found here. The photos are a terrific look into the computer technology in the 1970’s. Here is a video that describes the operation of KinSyn, which I find to be an impressive integration of kinematics calculations in the background with a useful graphical presentation of information to the designer. I have to say that the graphical display was impressive in its day. This is a Geogebra animation of the leg mechanism for the Strider walker. It is a symmetrical design that allows the formation of a second foot assembly by simply adding two more bars. This is an animation of the leg mechanism in the TrotBot walker.